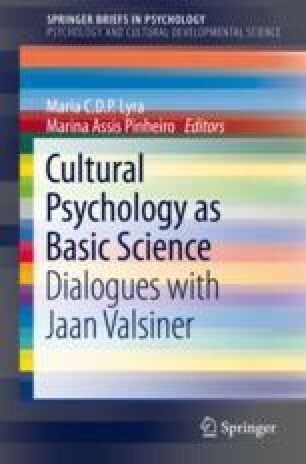 Cultural Psychology has been progressively viewed as a multidisciplinary field on the borders of psychology, semiotics, and cultural studies focusing on how individuals make their experiences meaningful (Cabell & Valsiner, The catalyzing mind: beyond models of causality, Springer Science, New York, 2014). With that in mind, the purpose of this chapter is to use theoretical approaches in aesthetics to discuss meaning-making processes in human trajectories; in other words, to link Aesthetics to a developmental approach in Cultural Psychology. From the assumption brought by Valsiner (Cultural Psychology as basic Science: Dialogues with Jaan Valsiner, SpringerBriefs, 2018, target paper 2) that the sublime is the affective border of the mundane and the aesthetic, this chapter explores a theoretical perspective in aesthetics – Nicolas Bourriaud´s Relational Aesthetics, which takes into account people´s – artists and audience – personal, affective relation to works of art. In particular, we look into contemporary Brazilian artist Wagner Schwartz (1972-) and one particular piece, “La Bête”, to claim that genuine participation during an artistic work constitutes the main condition of transit. Participation, then, is the locus of the sublime. Bio. (2017). Retrieved from https://www.wagnerschwartz.com.